The opportunity to experience a world of music returns this summer at the Caramoor Center for Music and the Arts in Katonah, NY. It is a truly a summer of musical diversity at Caramoor, as the center is set to begin its 71st season of summer concerts in June. Music lovers will be treated to eight weeks of everything from the sounds of Beethoven to the foot-stomping beats of bluegrass and creole. Located merely an hour's drive from Manhattan, the center is tucked into 90 acres of pristine gardens and architecture in Westchester County's Katonah, making this experience one truly great escape. 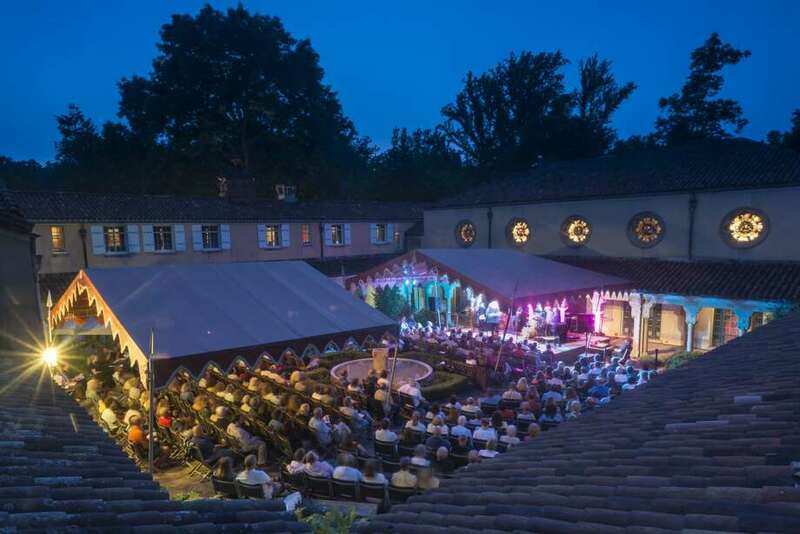 Caramoor Managing Director Paul Rosenblum said there's quite a lot that goes into each concert and incorporating music into every area of the center's property. "It's just a lovely place to explore," Rosenblum started. "By playing music and having musicians all around the place we invite people to see everything Caramoor has to offer." Summer concerts take place in two outdoor theaters, the 1,508-seat Venetian Theater and the smaller 470-seat Spanish Courtyard, as well as gardens across the center's campus, including a special garden arranged to best serve those with visual and physical disabilities. The grounds are also perfect for a fun family picnic, children's activities, or taking part in Sunday afternoon tea. Rosenblum said no matter where you are or what you're doing, music will be in the air. "We try to keep it as busy as we can," Rosenblum said. "Sometimes [music plays] at the same time. We try to manage it as best as we can. You may have to be a little selective in what you're hearing. But music is everywhere." The concert series starts off with an Opening Night Gala and concert full of glitz and glamour, with Tony Award winning star Kelli O'Hara and the Orchestra of St. Luke's led by Rob Fisher at the Venetian Theater. The two musical powerhouses will belt out Broadway show tunes, favorites from the Great American Songbook, and classical masterpieces. Caramoor's Artist-in-Residence Jonathon Biss is returning this season as the "authority on Beethoven." Biss will present the "Appassionata" and "Tempest" Sonatas and will join his moth, violinist Miriam Fried, for chamber works by Brahms and Janáček. The center will also present Beethoven's sole opera, Fidelio, which explores Beethovenian themes of heroism, sacrifice, and delayed triumph. The opera will star Elza van den Heever as Fidelio, opposite Paul Groves as Florestan. The center isn't just in the business of classic music. Caramoor's American Roots Music Festival is an all-day event dedicated to the sounds of Americana. New Orleans headliners Hurray For the Riff Raff will belt out some hot creole sounds and fiddler Sara Watkins, of the folk group I'm With Her, will wow audiences with their heartland rhythm. Other performances by John Fullbright, Man About A Horse, The Lowest Pair, and Silver City Bound among many more are also in this summer's festival lineup. As expected with the summer, visitors can expect an incredible display for Independence Day, a center signature. Fan-favorite Curt Ebersole and the 60-piece Westchester Symphonic Winds returns this year, as well as Broadway star Ryan Silverman, a tribute to Frank Sinatra, and euphonium soloist John Palatucci. And of course, the night will be capped of with a magnificent fireworks display in true Fourth of July fashion. The process behind the Independence celebration is just as free-ranging as the sights of the fireworks themselves, according to Rosenblum. "[Ebersole and I] have a free ranging conversation of what we're going to have, what kinds of tunes from patriotic, marching, the Overture of 1812 is always popular," Rosenblum said. "That's the kind of menu we're trying to deliver. "It's really a lot of fun for people who like to celebrate the Fourth of July. We'll have Uncle Sam and Lady Liberty stilt walkers; they'll even cameo during the show. I don't want to give too much away though." This year the Caramoor Center is also holding it's 23rd annual jazz festival. Tap your toes to daytime performances by the Evan Sherman Big Band; Ladies Sing the Blues featuring Catherine Russell, and Gotham Kings—to name a few—capped off in the evening by the always sensational Chick Corea Trio. As with the Independence Day celebration, curating the Jazz Festival lineup also beings with a free-flowing discussion of everyone the center wants to try and present before even considering how to schedule the concerts. "The Evan Sherman Big Band is a intergenerational band. The Gotham Kings play early 20th century jazz. There's something for all age groups to discover," Rosenblum said. "It's just a really rich, long list of artists." The all-day festival is a complete jazz-a-thon across the center's grounds, a set-up borrowed from the center's American Roots Music Festival. "We do this all-day concept, which started with [the American Roots Music Festival]. The idea is to help people find their way around and experience all the beauty of Caramoor," Rosenblum said, also noting the array of activities from scavenger hunts to tours of the historic grounds. The music experiences Caramoor curates every year are ones that don't come by audiences often. Whether it's your first or fifth time, Caramoor's summer performances are sure to leave a lasting impression. "We have the same people come every year and they enjoy it very much every time," Rosenblum said. "Just come with open ears. It's truly a lot of fun."